Today we've got a new board from ASRock on the BCCHardware test bench and we are very interested to see just what it's capable of. 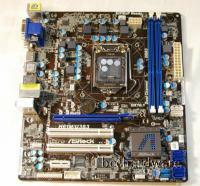 The H61M isn't the fanciest board available from ASRock but it offers a great amount of features on a board that is very affordable in a micro ATX form factor. 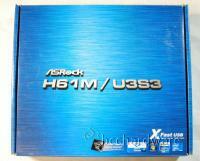 The H61M from ASRock is based on the Intel H61 chipset and supports the 2nd generation (LGA 1155) Intel i7, i5, and i3 CPUs. This is the first LGA1155 Motherboard we've reviewed (we've got some more coming in the coming weeks) so we will be comparing this board up against other Intel and AMD motherboards which should be very interesting to see how it can compare to previous Intel chipsets as well as the competition (AMD). While this board might be a micro ATX board it still has a ton of features which makes this board very suitable for a HTPC where space is limited or in basically any application where you don't need a full size board. 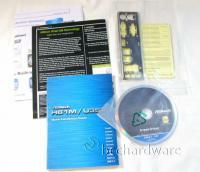 Let's take a look at the H61M from ASRock in the next section. We'll keep this section pretty brief as we take a look at the H61M/U3S3 motherboard. As you can probably see already the H61M/U3S3 is a pretty standard looking Micro ATX board. As you can see in the picture above you get 2 memory slots (max of 16GB of memory), 2 PCI slots, 1 PCI Express 2.0 x16 slot (for a dedicated video card if you need more power than the onboard video offers) and 1 PCI Express x 1 slot. If you take a close look around the CPU socket you might notice the holes where the CPU cooler mount too look a little strange (and there are a few extras). This is the first board that I've seen that has additional mounting holes to let you use your old LGA775 cooler if you want on your new LGA1155/LGA1156 motherboard. Not a huge deal to most people but it can save you a few bucks if you want to upgrade the CPU cooling of your system and have an old cooler kicking around from a previous computer. On the side of the board you'll notice that you've got tons of ports to work with. Included onboard is a 6 channel Realtek audio controller, onboard gigabit Ethernet, 4 USB 2.0 ports, 2 USB 3.0 ports, VGA, DVI, and HDMI video outputs as well as your standard PS/2 mouse and keyboard ports. Basically this board has everything you're going to need built-in so putting together a system is going to be pretty simple. So that's what the H61M/US3S looks like, in the next section we'll take a closer look at some of the features and specifications that this board offers.